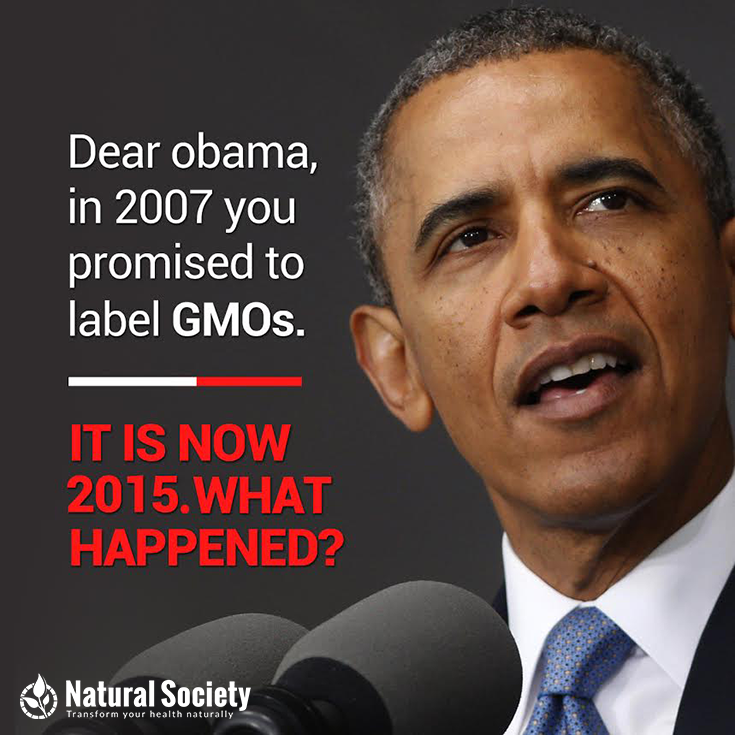 It’s time for President Obama to keep his 2007 promise to label GMOs. In his own words, Obama declared it was our ‘right to know’ what we are eating, and we agree. That’s why I have launched a White House petition asking Obama to keep his 2007 promise to enact GMO labeling nationwide. The petition comes at a crucial turning point in the fight for GMO labeling, as the notorious ‘DARK Act‘ that would make GMO labeling illegal has been approved by the House of Representatives and is moving towards the Senate. The fate of the legislation, officially known as the ‘Safe and Accurate Food Labeling Act,’ could soon come down to Obama’s signature (or veto). In other words, it’s now more essential than ever that we bring Obama’s 2007 promise to the national spotlight. Otherwise, we could soon see the same President who promised GMO labeling sign off on a bill that would make it illegal. Sign the White House petition asking Obama to keep his 2007 promise! In your 2007 campaign speech, you promised to protect our ‘right to know’ what’s in our food by labeling genetically modified organisms (GMOs) in the food supply. It has now been eight years since that promise was made, and you have done nothing to act on this promise. What’s more, a food bill passed by the House known as the ‘DARK Act’ could soon make mandatory GMO labeling illegal in the United States. If you are to sign this bill into law, you would be doing the exact opposite of what you promised us in 2007. Please deliver on your 2007 promise. Veto the DARK Act that would make GMO labeling illegal, and institute mandatory GMO labeling in the United States. We have the right to know what we’re eating. 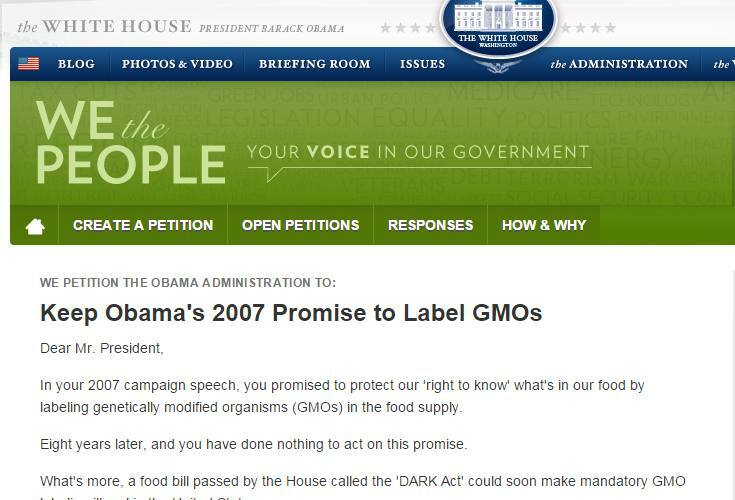 Let’s remind Obama of his 2007 promise and ensure that he does not sign off on the DARK Act, making GMO labeling illegal! What about affordable health care. Iam 44 was paying $127 a month now i make less money and me health insurance is $240 that i had to drop thanks Obama Barry what ever your name is.. Does anyone still believe that were a Constitutional Republic, under Democratic rule? This is Domestic Terrorism! Them whores in DC and Wall Street need to be droned! President Obama must be held accountable for his promises and that he upholds our constitutional rights to decide what is legal and what is not. This petition will show the representatives how the people truly feel about GMO labeling and GMO’s themselves. We are fighting for our lives as the enemy’s of americans can now poison us with our own food chain. Monsanto is the home chapter of ISIS. Getting a tumor in your head is the same as chopping it off. the only hope I have for Obama is that he doesn’t screw the country over more than what he’s already done. he is not allowed to do or try to do anything he wanted to do. Ther are a group of anti-Americans who don’t let him move. They only want to make him look bad, an play games like they were 5 year old, and think they are funny stopping things to help ALL AMERICANS, like g…. tea….. and many others groups ETC. Petitioning a puppet!? He was puppetized before walking through the whitehouse door. That ship has sailed, he’s been bought and paid for.